The introduction of our new lean lift has allowed us to streamline the purchasing process for our customers, cutting down on lead times, ensuring you get what you need, when you need it. We think you will agree with us - Locinox is all about engineering smart solutions to obtain better fences for your clients. Every year we launch more than 15 new products. Most are developed from scratch, but some are optimized developments on existing products. We are thus happy, excited and proud to announce the VTC-2 – the updated version of the well-known Verticlose-STD and Verticlose-RAIL gate closer. Both are high runners and we are convinced the VTC-2 will even be better. But how much better is it? No more choosing – the 90°, 180° and wall situations are all included in one package. And the best of it all – the price is exactly the same. More value for your money! This is a ‘running change’, the new VTC 2 will be launched when stock of VTC STD and Rail goes under a minimum. As of this date, no more Verticlose-STD and Verticlose-RAIL gate closers will be delivered. After-sales service to the Verticlose-STD and Verticlose-RAIL gate closers will keep on going for a while. The exact date will be communicated later. What about the drill pattern? The VTC-2 uses another drill pattern as the Verticlose-STD and Verticlose-RAIL. This is important for you to know if you or your clients prepare the posts and gates in advance. As usual, you can expect all the necessary drill templates from us. And if you want an even faster installation, use the drilling jig (coming soon). What if I want to replace my Verticlose-STD or Verticlose-RAIL by the new VTC-2? This is perfectly possible. We will inform you extensively soon with a thorough manual for retrofitting the new VTC on the existing hole pattern. There will be a special installation video as well. We understand you have a lot of questions. We strongly recommend you to get in touch with us if you would like more support or input on the VTC-2. In the meantime, we are working hard to complete all the documentation about VTC-2 (manual, installation video, comparison sheet, drill pattern, technical drawings …). As soon as we have more information to share with you, you will hear from us. Don’t forget to keep an eye to our website for the latest information. We cannot give exact dates yet but we thought it to be important that you were informed well in advance. With the SlimStone keypad, Locinox is taking its first steps in the outdoor electronic access control industry. As one of the trendsetting players in the fencing business, the strategy to develop a high quality keypad is actually a very logical one, as explained by Lieven Pieters, Sales & Marketing Director at Locinox. “A few months ago we launched the Modulec-SA Kit. This kit consists of the premium surface mounted electric Modulec keep, the SlimStone keypad and the power supply. This way, the installer orders very quickly everything he needs to turn a regular gate in an extra safe environment where intruders are kept out.” explains Lieven Pieters. “We are not launching an innovation without having it fully tested. In SlimStone’s case, this resulted in a few remarkable tests. We tested the buttons on more than 2 million pushes by emphasizing its durability. For example : if you use the SlimStone 4 times a day, your SlimStone keypad will be your closest ally during 342 years. Even if you use it 20 times a day, you are enjoying a perfect use for 68 years.” continues Lieven Pieters. The adjustable integrated white LED-lights allow a safe and efficient operation during the night or in case of bad weather. And as a nice extra, the energy use is kept very low – which is a plus on the energy bill. The bearing strength of a gate closer is an important element. But did you know that temperature can have an effect on the closing speed of your gate closer? Gate closers are exposed to extremely variable weather conditions: cold in the morning, hot at noon, freezing in winter. A hydraulic gate closer operates through the combination of a spring and hydraulic oil. This oil is susceptible to outdoor temperatures, and thickens as temperature lowers. If this problem isn’t solved, the closing times of the gate closer can rise sharply, or the gate closer might stop functioning. The perfect closing time for a gate closer (for a 90° opening angle) is 7 to 15 seconds. This is called the ‘comfort zone’. If the closing takes longer, it might represent a problem for safety. Shorter is no option either, because the gate would slam so you wouldn’t be able to easily go through the gate. Many solutions available on the market do not match our objectives: gas springs are too sensitive, and small gate closers are extremely hard to adjust. Locinox gate closers perfectly solve this problem, and make sure your gate always closes within the comfort zone. Thanks to a patented hydraulic damping, a Locinox gate closer adapts itself, even in extreme temperatures. We can thus guarantee that the gate closes steadily, without the necessity to adjust the gate closer. To make sure that our gate closers comply with our promise, we submit them to extensive tests before and after market launch. Only because of this permanent monitoring we can guarantee you the best quality! We compare the closing speed of our gate closers with similar products by other manufacturers. How did we perform the test? We set all the gate closers at room temperature. Next, we exposed them to temperatures from -30 °C up to +70°C, and measured the closing speed at an 90° opening angle. Once again, Locinox pushes the boundaries of the gate closers industry by launching its latest 180° hydraulic self-locking hinge: the Tiger. Some years ago, Locinox launched the Mammoth: a 180° hydraulic self-locking hinge for gates up to 150 kg and 1,5 m wide. The ease of instalment of this product – drill 8 holes and secure with Quick-Fix – has become legendary, and its sale continues to increase. Locinox’s hydraulic self-locking hinges offer many advantages to all market players. The installer doesn’t need to worry any longer about the standard distances between hinge and gate closer. The manufacturer can include a self-locking gate in his product range, so the installer no longer has to pass a separate order for a gate closer. The distributor can easily recommend this solution without any installation support being required. The Tiger can be mounted on gates up to 75 kg and 1.1 m wide, and is now available. In 2017 Locinox keeps on innovating by launching new products. We are proud to present the first one: Puma, the perfect aesthetic hinge for residential gates. This 180° hinge can easily be installed thanks to the Quick-Fix fasteners. No welding required! The Puma hinge supports gates up to 1 m wide and with a maximum weight of 60 kg, without loss of convenience. Thanks to the aesthetic design and the powder-coated aluminium housing, the hinge can be combined with the latest gate concepts. The PUMA hinge is in stock and available for next day delivery right now. All items in our Locinox GBMU product range are fully interchangeable. From this perspective, and in order to obtain a more precise and secure weld between the hinge claw and gate profile, we decided to improve our 4D hinges. In 2015 we launched the Locinox phase 1 change with a universal claw nut 4D-FIX for the GBMU4D16 and GMBU4D20 hinges. Phase 2 came with a new and smaller claw. And now we have reached the final phase. We introduce the updated GRIP 20-ALUM which fits the universal claw even better. The other colours are to follow in the upcoming months. GRIP 16 will be launched in March. Locinox is a company that is constantly on the move. Each year they launch numerous innovations in a never-ending search for new and improved products. A recent product update of the eyebolt 1004SET-M20 and the crossbolt 1003SET-M18 increases the protection against burglary or vandalism. Combined, these parts form the hot-dip galvanized eyebolt-set 1034HDGA-M20. Both products are provided with an extra security making them burglar proof. It is no longer possible to unscrew the hinges to disassemble the gate. Only when the gate is opened, the bolts can be unscrewed. For more information, drawings and dimensions you can check out the product page linked above. Our magnetic locks, especially designed for exterior use are virtually indestructible. A careful choice of stainless steel raw materials, a thought out design and a lack of moving or components, guarantee years of maintenance free outdoor use. Driven by an increased demand for easy to integrate access control solutions, such as electromagnetic locks and by our desire to offer the most complete range, our MAG2500 and MAGMAG2500 locks are now also available in RAL 6005. Both can easily be ordered directly here on our website. 500h salt spray resistant! SGS certified. In the first weeks of 2016, we were excited to announce our new SAKL and SHKL keep (pictured). To answer some remaining questions and to keep you as a client informed, we are giving some more details about the made changes and the associated advantages. Materials and surface treatments which are up to years of outdoor use, are a basic requirement. 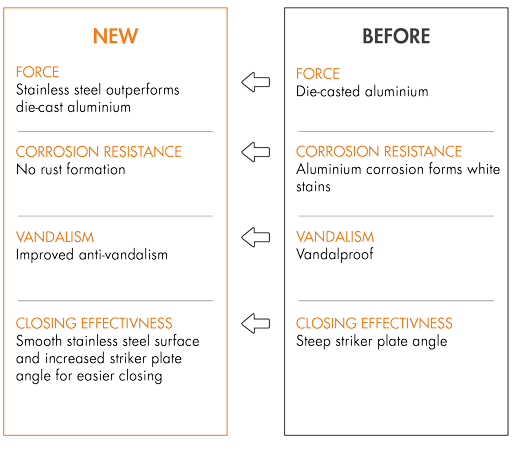 This is why we only use stainless steel and non-ferro metals as raw materials for our products. The SAKL and SHKL keep are now both stainless steel keeps with a polyamide finish. Next to a pleasing aesthetic appeal, excellent temperature resistance and durability, the material change offers more advantages than meets the eye. We summarized them below!